WHO’S seen Robocop? How about District 9? Of course you have; they’re both great movies. Drama, action, rebirth and redemption, a mechanical underdog to root for: that’s what great robot movies are about. Chappie – the latest effort from South-African writer/director Neill Blomkamp – is most certainly a robot movie, but it’s clear from the start that the required ingredients to make it a great (or even a moderately acceptable) robot movie are seriously lacking. It’s got some drama. Action: a little. Rebirth and redemption: meh. An underdog to root for? You’ll be too busy cringing at his cheesy dialogue with South African rap royalty Ninja and Yolandi Visser of Die Antwoord playing Die-Antwoord-as-gangsters-wearing-Die-Antwoord-tops-but-we’re-still-gangsters-honestly-I-promise. 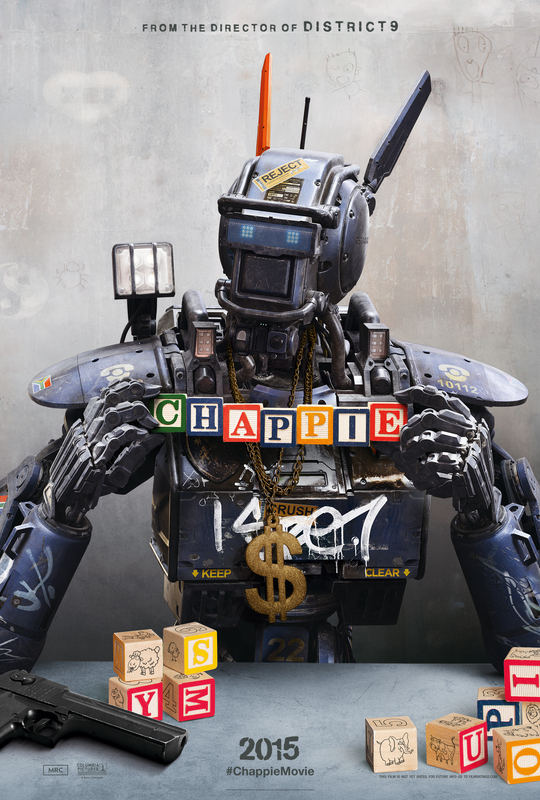 The aforementioned Chappie is one of several hundred robots created by inventor Deon Wilson (Dev Patel) and commissioned by the Johannesburg police force in an effort to reduce crime. Wonderfully-mulleted Australian engineer Vincent Moore (Hugh Jackman) is Wilson’s nemesis and wants his creations to fail so his own crime-fighting creations can prevail. When Wilson steals a damaged robot in order to experiment with his new AI software, he is kidnapped by the Die Antwoord pair, who need to find a way to make the robots inoperable in order to pull off a heist and pay back a debt. Wilson convinces Ninja and Yolandi that he can create a robot to do their bidding, and Chappie is born into a world of crime and finger-painting. This is where things begin to go rapidly downhill. The more Visser becomes involved in the dialogue, the more you can practically see the cogs turning behind her eyes every time she says a line. A generally plodding plot, the ridiculous Chappie-talks-gangsta moments, and the fact that we are meant to believe drug-dealing murderers “turn good” in the end, thanks to spending a few days with a childlike robot, are difficult to accept. When Moore attacks Chappie and saws his arm off, what do his new friendly murderous friends do? Just attach another one by pressing it into the socket, obviously; no training in mechanical engineering required here, no sir. It also feels like a unforgiveable missed opportunity with Hugh Jackman’s character; this guy could have been written as a hugely laughable comedy bogan/bad guy instead of the unbelievable macho bad guy he is – Jackman could have pulled it off perfectly with those tight shorts and mullet. You’ll probably ask yourself how Dev Patel got his role too. Is it because (a) he cheated, (b) he’s lucky, (c) he’s a genius, or (d) he needs to fire his agent. Lock in (d), Eddie; final answer. With a finale that is almost lifted straight out of District 9, and featuring the inevitable showdown between Chappie, Moore, Wilson and the gangsters in an explosive (literally, not dramatically) few scenes, the movie comes to a close in predictable fashion, but it’s an anti-climactic feeling of missed opportunities when the last-of-many Die Antwoord song plays as the credits role. Do yourself a favour and stick to Robocop; even the remake, if needs be.